February felt like such a short month and with other commitments taking up all my time I have somehow filled my January Monthly Notebook, but not ACTIONED all of it. So this week I have started going back through my TuNeues Notebook and made it actionable. So how am I making it actionable? I have tried many different methods this time I have chosen to do this using a Frixion Light by Pilot (an erasable highlighter).Starting at beginning of my old monthly notebook I have assumed that I have actioned and dealt with most of the notes that I have made. 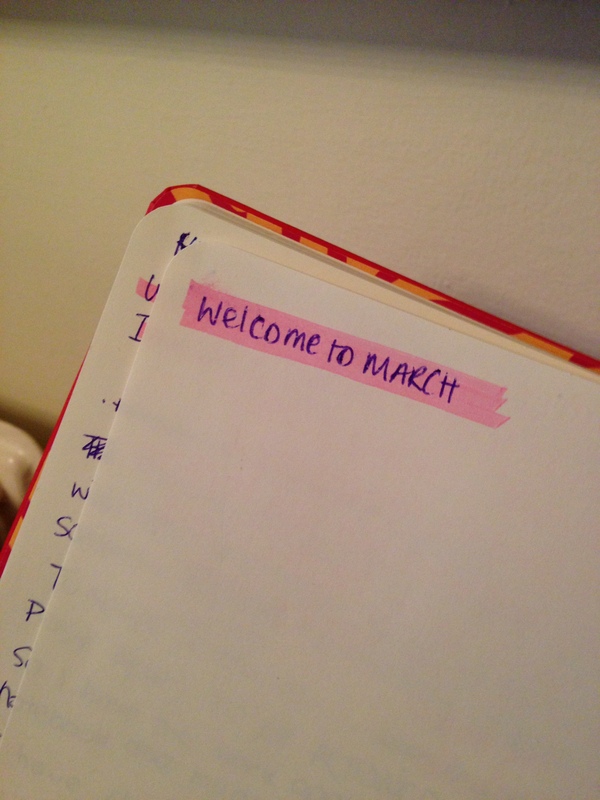 I use the highlighter to mark up those things that I wish to do in the future – e.g. writing ideas, things to research, things to do or things I have to read. If something is not actionable but I want to transfer the information to another place or notebook I also do this at the same time. Any extra notes that I want to add while reviewing the existing notes I usually write these in the highlighter pen as well so that I can tell they are new and relate to the freshly highlighted content. I usually carry out this initial review on the go when I have a quiet or idle moment such as when travelling by bus or waiting at the train station. Following the initial review I then set aside a block to time to work on the actionable to-dos highlighted in the notebook. This is usually when I have some free time and I am in front of my computer (but not always the case). 2). Simply browsing the notebook and picking something you are inspired to (or feel like doing) within that time block. Either method can be very effective. It is also a great method of reviewing used monthly notebooks before archiving them. Great post Anna! Note books! I have zillions of them in sometimes tiny crabbed writing, or larger bolder writing depending on size of note book.. It’s interesting to me to pick one up and browse through it – invariably it makes me ponder and gives me ideas for writing .. I found you through the A-Z … jumping around and commenting on those that of interest to me. Thanks for Visiting 🙂 Always happy to meet another notebook collector. Oh wow–notebooks! And a solution for my prolific notetaking that, more often than not, ends up going nowhere. Thank you!